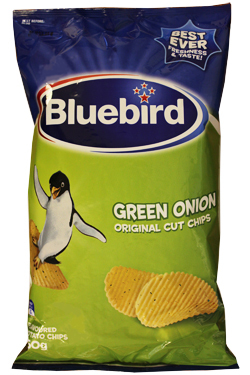 Made with 100% New Zealand grown potatoes. Original cut chips with tasty green onion seasoning. Potatoes, Palm Oil, Salt, Onion Powder, Sugar, Whey Powder (Milk), Flavour Enhancer (E621), Wheat Solids, Herb (Parsley), Flavour, Food Acid (Citric Acid). You cannot get this flavoured chip in any other brand I have found in UK, Aussie etc. It is a unique flavour that is additive and moreish.